Its a fine looking one but look greater if can do some balancing training. 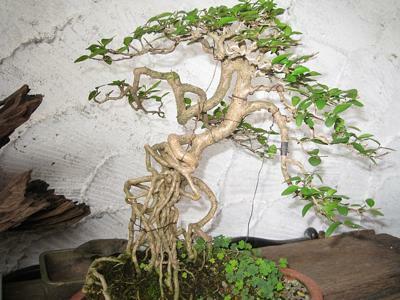 that is one great naturally formed nebari or exposed roots...it can be also informal upright...a sort of mix...a mixture of both styles...that is a rare find if you only dug it, but if you grow of it its good as well. you either let the roots thicken or you continuously loose the topsoil subsequently over the years or it could be that in the 1st place it is already thick.....either way its a great specimen...cheers! This is exposed roots style.